I have only read the reviews so far, but her tip is interesting enough to recommend the book here. 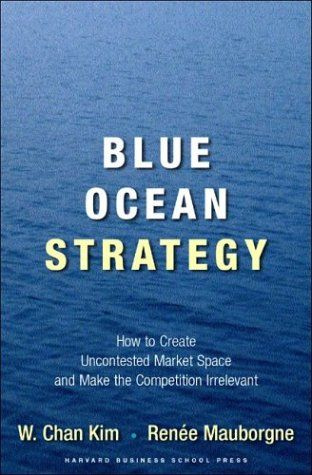 The blue ocean is a metaphor for an uncontested market. Red oceans, by contrast, are most of the markets we have today, where companies try to outperform their rivals by grabbing a greater share of the existing demand. No matter how skillfully you compete in existing markets, with tools such as differentiation, market focus, benchmarking and downsizing, there are bound to be losers. The bloody battle turns the ocean red. The alternative propagated by this book is to open up unknown and untapped markets, and it provides a framework and analytical tools to pursue and capture them. They eliminated star performers, animal shows, aisle concessions and multiple arenas. and they created themes, a refined environment, a theatrical story and artistic music and dance. This allowed them to create what the authors call “value innovation” which occurs when companies align innovation with utility, price and cost. A company must produce something of value to the customer at low cost to be successful, and finding that sweet spot of differentiation is what value innovation is about. The tools of elimination and reduction are the key to dropping costs, while raising and creating are the tools to reach new buyers. This breaks the traditional cost-value trade-off of the old economy, in which higher value results in higher cost and makes you less competitive. and to reduce management risk by building the execution into your overall strategy. The authors, W. Chan Kim and Renée Mauborgne, are professors of strategy and international management at INSEAD in Fontainebleau, France. Now if I could only figure out how to apply all of that to my own little business, I, too, could sail out into the big blue ocean. Visit the BOS website and discover: How blue is your ocean? Here’s a clip from a Cirque du Soleil show.